Track and manage all your domain names. Is there a better alternative to Domainer? Is Domainer really the best app in Internet Utilities category? Will Domainer work good on macOS 10.13.4? Use Domainer to track and manage all your domain names. Domainer allows Web site owners to centralize domain details, as well as those of their competitors, with one easy to use application. Domainer provides an overview of a domain's value through various popularity measures including Google PageRank, AlexaRank, incoming back links, and social tags. 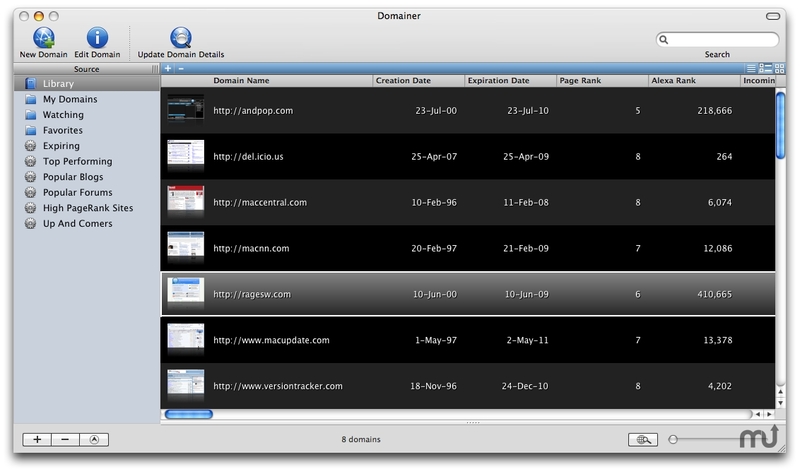 Domainer is the only Web developer's tool for the Mac that helps domain owners easily gauge the value of domains in addition to tracking all whois information automatically. Domainer syncs with iCal and the Mac OS X keychain to notify owners of domain expiration details and to securely store FTP login details.